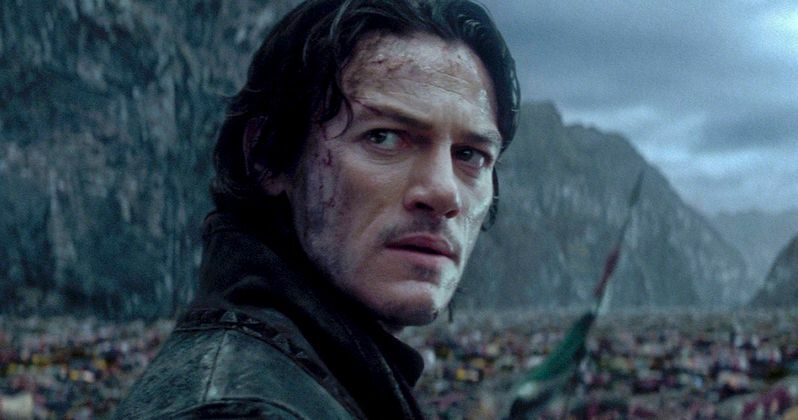 Luke Evans picks up the heavy mantel of Vlad the Impaler in Dracula Untold, which combines fact with fiction to give audiences worldwide new insight into the vampire legend. Faced with an evil like no other before it, Vlad takes upon himself an ancient curse that will allow him to save his people. It also means he'll never grow old or die. But will these new found powers be enough to stop the impending threat of Mehmed, played by the imposing Dominic Cooper? Both men are present in a select series of images from this origin thriller, in theaters this October just in time for Halloween. A ship is wrecked near Whitby and the only survivor, Count Dracula, is found on a beach by a sickly young woman named Mina. Mina is staying with the family of her good friend Lucy Seward, whose father tries to make Dracula feel welcome. The Count takes Mina's life and then begins to court Lucy. When Mina's father, Dr. Van Helsing, is notified of his daughter's death, he comes to the Seward's home, quickly deduces that a vampire was the cause, and before long realizes who that vampire is. Convincing the others of his theory, he works with Lucy's family to stop Dracula from taking her with him to Transylvania.